It turns out that Number 6, my final chemo, packed a punch that I wasn’t expecting. Having decided that the 5th cycle was quite possibly the easiest one up to that point, I assumed I had the upper hand. Side effects kicked in much sooner than previous treatments. My tastebuds were affected pretty much immediately and an upset stomach landed with a vengeance within a couple of days. I was exhausted through lack of food and sleep, queasy and fed up! However I clung onto the hope that since things had kicked off earlier they would dissipate sooner. That made perfect sense to me. In fact Number 6 has been a slog. Not only have I felt rough most of the time I found myself at the hospital pretty much daily for the first 10 days. The final chemo triggered lots of appointments – scans, consultants, tests and more consultants. 6 appointments in 7 days across 4 different hospitals while dealing with Number 6’s pummelling was tough. Eating was a massive chore this time – pretty much from the start. It has been difficult every time but Number 6 really didn’t want me to eat. I lost 10 pounds in 10 days. Now secretly I was quite happy with the weight loss – I could stand to lose it. I had found a rare silver lining. All I had to do was keep it off and I would be exactly where I wanted to be weight wise. I thought that would work. A few days ago I had my first Herceptin injection. These will continue until early next year. I wasn’t worried at all about this – I’ve been having Herceptin intravenously alongside my chemo for almost 4 months so I knew I wouldn’t suffer any adverse reactions. But what I didn’t know was quite how painful the injection would be. Even when the nurse warned me that it would sting (chronic understatement) I’m looking at her with my “I’ve been through chemo do you really think a little injection will phase me” face and she’s looking back with her “you’ll learn the hard way” face. So with my jeans round my ankles and my thigh positioned for the jab, I just knew it would be fine. I’d be lying if I said I was totally back to normal now. I’m still having the occasional upset stomach almost 4 weeks on. I’m now also anaemic (Number 6 trying to have the last laugh) so that has been dragging me down a little. 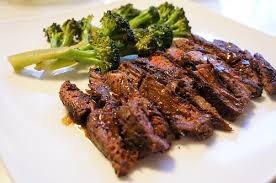 But plenty of steak and broccoli will fix that I’m sure 😊. Before you start feeling too sorry for me it’s really not been all bad. I wasn’t going to let Number 6 beat me so when I’ve felt well I’ve taken advantage of it. I’m way too determined (my family use the word stubborn but I think they’re being a bit harsh!) to let a tough chemo cycle stop me. So I’ve managed a couple of trips to London, a trip to Snowden to support my 3 peaks friends, worked for the last 2 weeks (in between hospital appointments and upset stomachs) and managed half a dozen nights out catching up with friends over food and drink (some of which I could even taste! Bonus!). And I’m now feeling good again. So stuff you, Number 6. You gave it your best shot but you just weren’t man enough.